Central Florida is becoming a hotbed of artistic activity — from theater to graphic design to cultivated graffiti — and UCF grads are at the center of the creative boom. 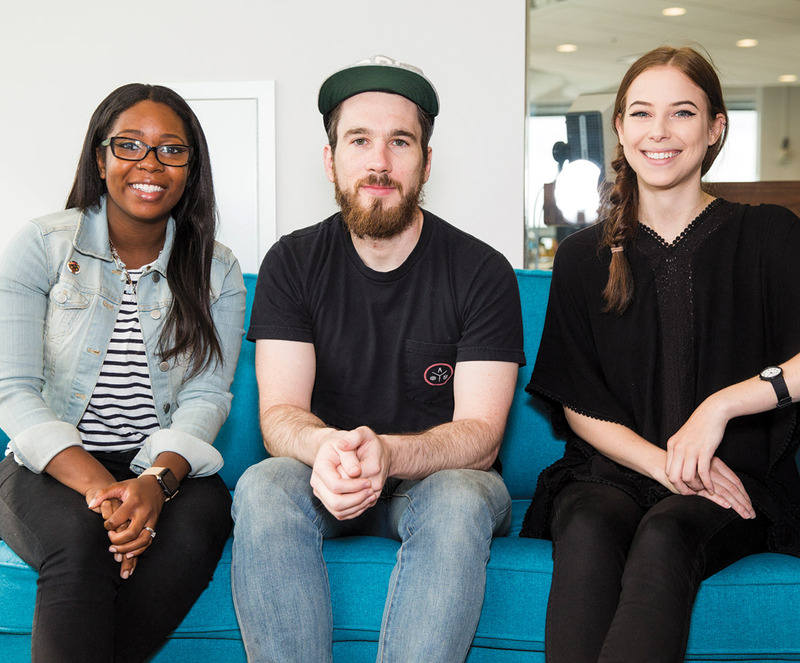 Ayana Campbell Smith ’14, Drew Powers ’11 and Morgan Walker ’12 created Orlando Creators along with Hillery (Brooks) Powers ’11 (not pictured here). Ayana Campbell Smith ’14 was born and raised in Orlando, and she had planned to leave as soon as she got her degree in graphic design. 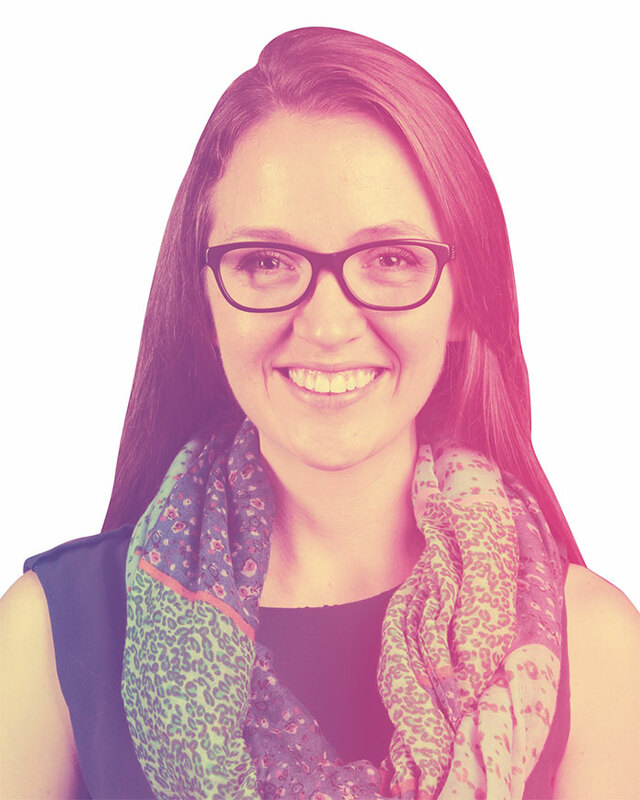 As a “creative type,” she intuitively looked toward the likes of New York or Boston to establish her career, but when she landed a job with an Orlando-based digital creative agency, she realized she was surrounded by other graphic designers and visual artists. Now at Envy Labs, a consultancy that specializes in software development and interface design, she teamed up with fellow Envy Labs designer Drew Powers ’11, his wife Hillery (Brooks) Powers ’11, and videographer Morgan Walker ’12 to establish Orlando Creators, an online interview series showcasing Orlando designers and visual artists. Ayana: Our goal at Orlando Creators is to spotlight the creative talent that’s in Orlando because I think a lot of people around the nation don’t realize how much talent we have here. Drew: The first people we interviewed have already had more exposure than we could possibly give them. We’re kind of leveraging their reach. These are designers and artists that are good enough to work anywhere in the world, and they choose to be in Orlando. Drew: Orlando is the hospitality mecca of the world, but if you stick around long enough, you’ll realize that there is a small community here besides the swirling sea of people coming and going. I am generally a big fan of archival projects. I would love for this to be an archive — a snapshot of a time in the city. I like living here, and I’m looking for ways to make my own city better. Ayana: There are other states or cities that have done similar things. There is a site called Made in the Middle, and it celebrates design and creativity in Kansas City. Drew: Tad Carpenter is the designer who started it. So we pretty much stole his idea outright. Ayana: It brings me joy to be able to spotlight these creatives, to give them a platform, to spread their message and then to share their work. To the soon-to-be graduates or creative types looking for their niche: Plug yourself into the local creative community wherever you are. Get involved, and see what you can do. Sean Walsh ’12, a graphic designer, has always had a love of the macabre. When he began creating lapel pins and bandanas with an eerie twist, he decided to put them online to see if they would sell. Seems he’s not the only one with a love of the dark side. I’m proud of where we live, and I’m proud of the people who are staying here and contributing to this community, both artistically and through small businesses. I realized I was working a day job and freelancing on the side, but I didn’t feel like I was making the contribution I wanted to. It was piecemeal — a hotel logo here, a food truck logo there — and I felt like I had more to say. I can pinpoint a moment in my childhood when I realized that I was attracted to the macabre. I got straight-A’s on my report card one year in elementary school, and to celebrate, my parents took me to see The Nightmare Before Christmas. That movie had such an impact on me. I love that flirtation with Halloween, the occult. I like that imagery. I’m fascinated by it. Some people get themselves organized and say, “I have a business idea, and this is my business plan, and these are my target goals.” I wish I could say that I was one of those people. Ryan Rivas ’05 was teaching high school English in Gainesville, Florida, when his wife’s job brought him back to Orlando. That’s when he met Julia Young, who had just started a program called Page 15. The idea behind Page 15 is to offer free creative writing and reading programs to Orlando’s children — and inspire a lifelong love of the language arts. 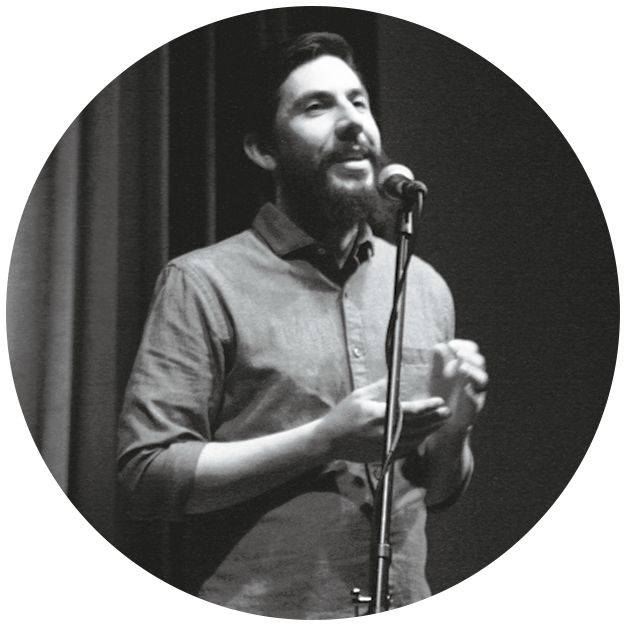 By 2010, Rivas had co-founded Burrow Press, an independent publisher of literary work, largely fiction. 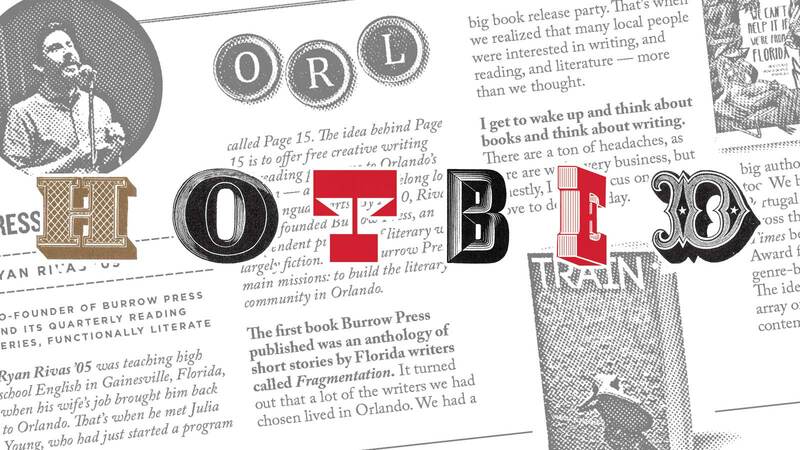 One of Burrow Press’ main missions: to build the literary community in Orlando. 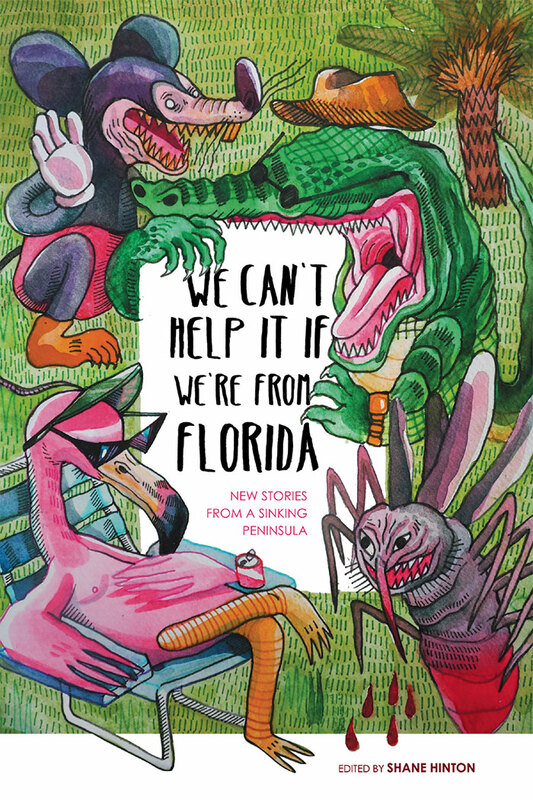 The first book Burrow Press published was an anthology of short stories by Florida writers called Fragmentation. It turned out that a lot of the writers we had chosen lived in Orlando. We had a big book release party. The writers came. The writers bought their friends. Their friends were writers. That’s when we realized that many local people were interested in writing, and reading, and literature — more than we thought. When we first started Burrow Press, we knew we wanted to have a community program. We started with a monthly reading series with J. Bradley ’01 called There Will Be Words. Later we started our own quarterly reading series, Functionally Literate: A Literary Function, named to reflect the irreverence of the personalities of the people involved with Burrow Press. There was a burgeoning writing community in Orlando. So we thought we could use our connections to bring in big authors and get locals involved too. We brought in authors from Portugal and Ireland but mainly across the United States. New York Times best-sellers. National Book Award finalists. Literary high-brow, genre-benders, experimental poets. The idea is to present the broadest array of what’s happening in contemporary literature. We’ve been lucky in that we didn’t have to pay for advertising or marketing. It’s grown through word of mouth, and to a certain extent, just a need for it. I get to wake up and think about books and think about writing. There are a ton of headaches, as there are with every business, but honestly, I get to focus on what I love to do, every day. 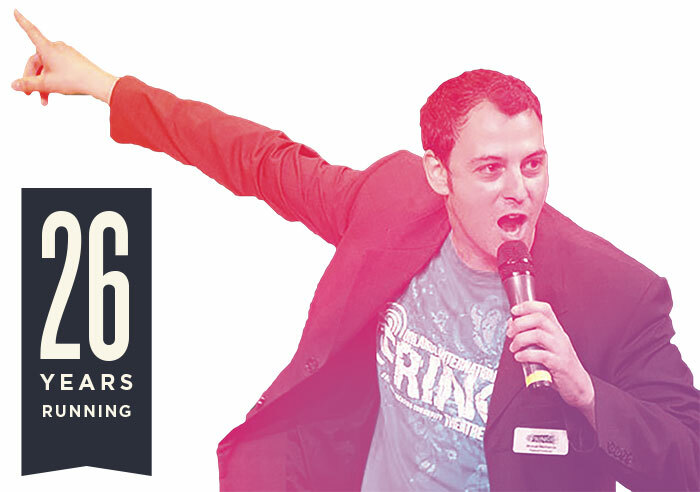 In 1997, Michael Marinaccio ’98 got together with some friends from Theatre UCF and created a sitcom called The Zombie Doorman. It was written by Tod Kimbro ’02. “Think of an R-rated Friends,” Marinaccio says. They took the show to the Orlando Fringe Festival, and Marinaccio fell in love with the atmosphere. 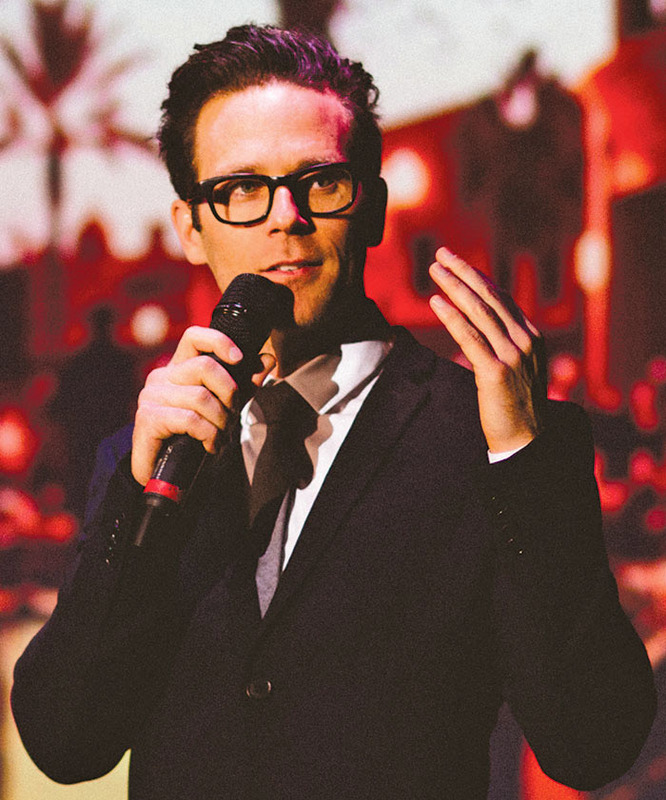 For the next 15 years, he produced, directed, acted in or wrote something for the Fringe. Then when the festival producer position opened up, he landed his dream job. I cry once every festival. It’s always tears of joy and inspiration. It’s usually from a show or an artist that far surpasses my expectations. There is a group called the Downtowners, a choir from Orlando Lutheran Towers, which performed. Their youngest member is around 70 years old, and their oldest member just turned 102. They sing fun pop songs and standards. They’re totally an amateur group, and you may not be completely blown away by the performances, but they show so much joy when they’re singing. It’s infectious. If you can watch a 101-year-old woman sing “Forever Young” and not cry, you’re not human. There are many different types of fringe festivals throughout the world, but I think the one thing that binds us all together is independently produced, cutting-edge performing arts. Fringe festivals are almost all multigenre festivals, so they include anything from juggling to drama, musical theater, poetry or puppetry. A lot of our audience members are not part of a regular theater crowd, but they come to Fringe because tickets are a maximum $12. And with 165 shows, there’s always something for everyone, whether it’s dance, stand-up, acrobatics or theater. Every year we have shows that range from really polished, professional works to brand new, amateur, “I’m-a-semiretired-electrician-and-I-decided-to-do-a-one-man-show-even-though-I’ve-never-performed-on-stage-before” works. That’s the beauty of it. Because it’s a lottery selection, everyone has the same chance of getting into the festival. Jim Hobart ’88 met Hillery (Brooks) Powers ’11 in his advertising course at UCF. A few years later, he hired Hillery to manage his photography company, Macbeth Studio, which largely focuses on portraits, architectural photography and video. As the business expanded, Hillery began to create custom backdrops for the shoots, which eventually evolved beyond the standard studio shoot. Macbeth, its photographers and those creative backdrops were being recruited for parties and fundraising events. 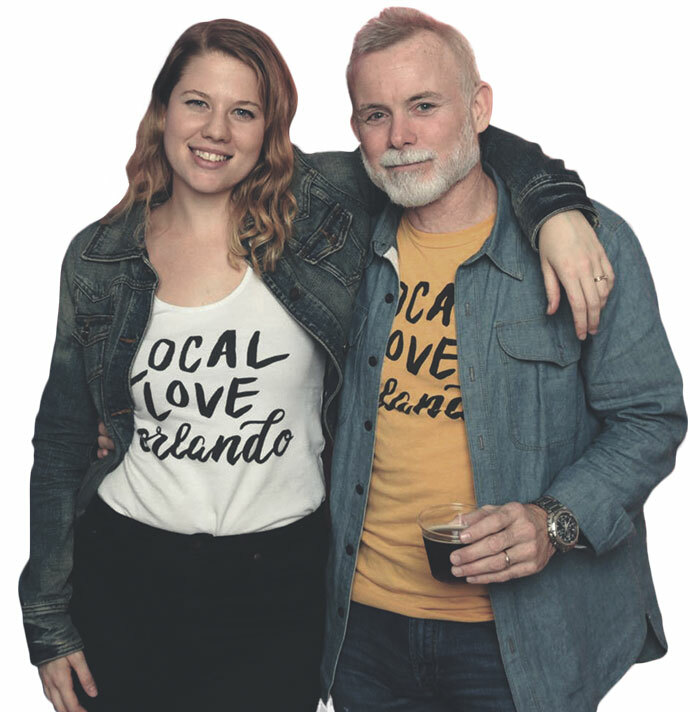 And some of that creativity became so popular that the pair created a spinoff, Local Love Orlando, which specializes in hand-drawn prints and goods that celebrate The City Beautiful. 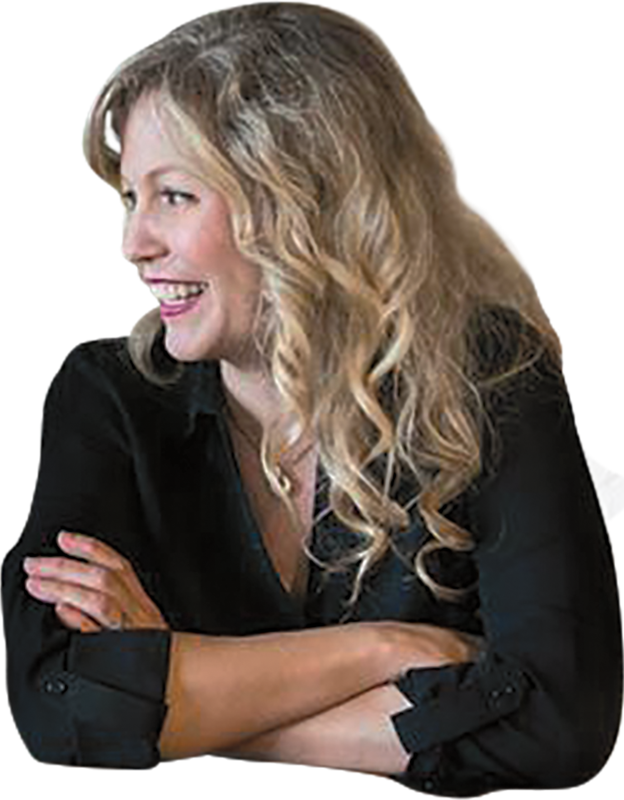 Hobart: When I started in the advertising world, there were some up-and-coming businesses in town that were starting to get national attention. Orlando’s been around since the late 1800s, but it felt like it was just starting to get recognized for more than Disney World. Over the 30 years that I’ve been working here, Orlando’s been growing and changing, and it’s nice to be one of the people who helped get things started. It’s like being in New York City in the ’80s when it was sort of re-emerging as an international hub. Hobart: I started a monthly event called First Friday Fotos, where I did headshots for very low prices. We would have 20 to 40 people walk through the door, and I would never know who was coming — large, small, black, white, old, young. I had every type of person walking through the door, and I had to learn how to photograph people. Then Hillery got involved and started saying, “Let’s make it a little more involved than just a red background. Let’s create something.” So, the photo booth backdrop evolved out of us trying to make it a little more interesting. And then that modified into fundraising for causes we believe in, and that evolved into events, and suddenly people were calling us for their wedding receptions, or their dinner parties, or their company holiday parties. Powers: We decided to do a backdrop for an event to raise awareness for a local homelessness campaign. So we made a map of Orlando. I designed it, and a few artists helped paint it. Dozens of people started reaching out asking for prints of the map. That’s how our print company, Local Love Orlando, got its start. Hobart: I’d like Macbeth Studio to be known as the photography and video firm you call when you have something going on downtown. And it completely dovetails with what Local Love’s doing. Even though they’re two separate companies, and they’re growing together but apart, I think that they’ll be connected. Macbeth incubated Local Love, and now Local Love is going to help Macbeth. Powers: I have lived in other places, and when I moved back to Orlando, I developed this love for the city. I was proud of the things that were happening here. I was proud of the smaller coffee shops, and the markets, and all these people who have invested in Orlando. And I really love being part of that. 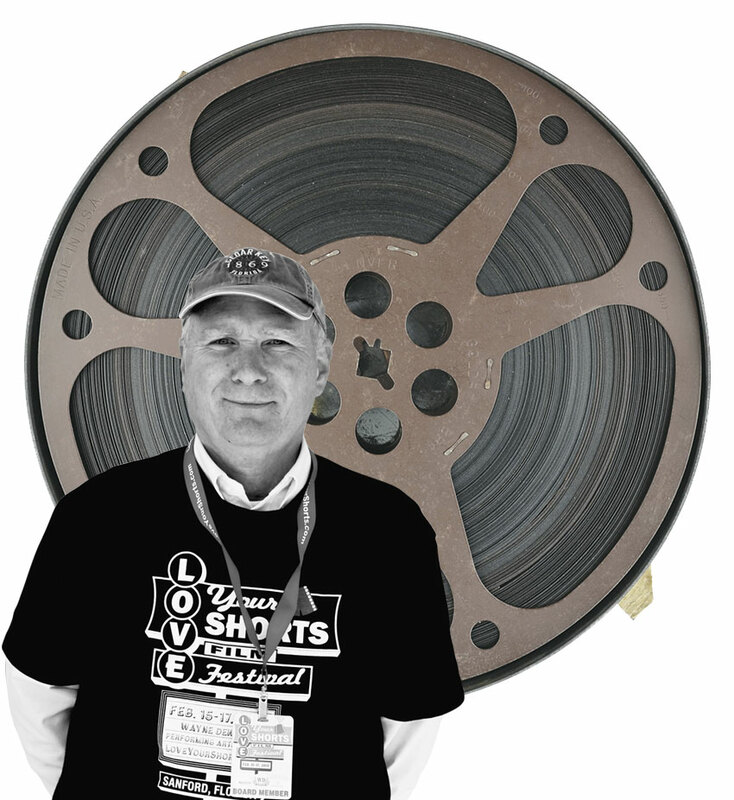 When Gene Kruckemyer ’73 and his wife, Nancy, discovered the Dam Short Film Festival in Nevada, they figured it was just the kind of thing that Sanford, Florida, needed. So they started their own film festival, Love Your Shorts, with friends, including Christina Grace Beverly ’04 and Nelson Beverly ’04, who have a love of the genre. Now in its eighth year, Love Your Shorts screens 70 to 80 short films at the historic Wayne Densch Performing Arts Center every year and welcomes more than 2,000 attendees. Gene: My wife and I were visiting Las Vegas and we went down to the Hoover Dam, which is right next to a little town called Boulder City. We were driving through and saw a short-film festival at the Boulder Theater. We watched the comedy block that night. Afterwards, they had a Q&A with some filmmakers and a meetup at a nearby microbrewery. My wife turned to me and said, “We could do this in Sanford.” When we came back home, we asked our friends if they wanted to be a part of this, too. Nelson: There were five of us that said, “Let’s make this a reality.” That night we registered the domain name Love Your Shorts. A year later, we had filmmakers from all over the U.S. and Canada come to Sanford for our first festival. Christina: Who doesn’t like a movie? And it’s even cooler when it’s a short film because it’s short and sweet. Now it is hard for me to sit through a two-hour film. I don’t like horror films, but for some reason I really enjoy watching the horror film shorts. Two hours of suspense may be a bit much, so maybe I can deal with five minutes of it. Gene: People these days are attuned to look for shorter things. Think about how people consume social media. We figured that this is a format that they’re used to, and it’s clicked. Nelson: That first year we were just making it up as we went along. We did it at our local chamber of commerce. We have a local historic theater, but we were afraid that nobody would show up. We sold out pretty much every showing. Gene: One year, a film we were showing, God of Love, was up for an Academy Award. The filmmaker couldn’t come to the festival, but his mother was here from Amelia Island. She accepted his award for Best of the Fest. Turns out, he was in California getting ready for the Academy Awards, where he won an Oscar. Christina: Since we started the festival, so many businesses have opened up here. We have new bars, new restaurants, new retail. Not that it’s necessarily because of the film festival, but to be part of the renaissance, bringing people here — it feels good. 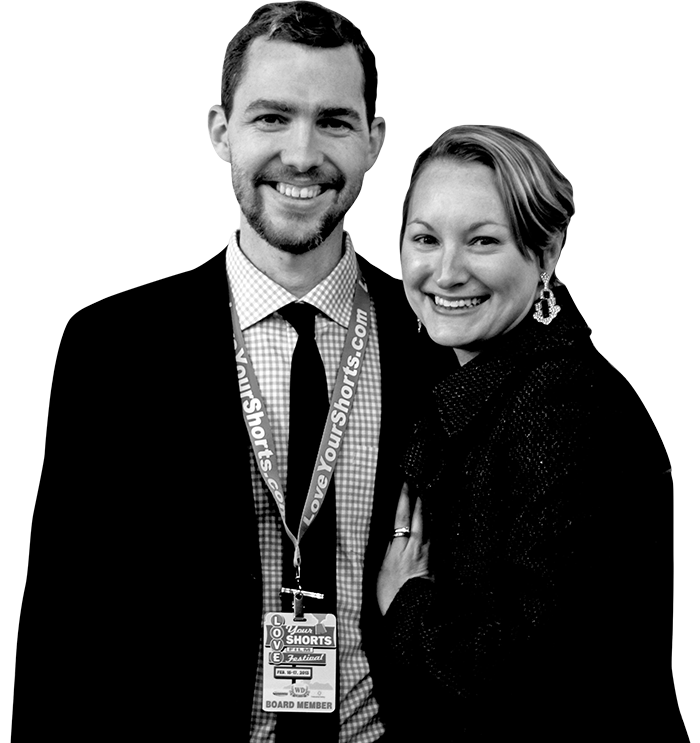 To Cole NeSmith ’07, bridges and roads are the skeleton of a city, but arts and culture are its soul. Nesmith developed the Creative City Project, an organization that hosts an annual public performance and installation arts event called IMMERSE. He spends the rest of his time advocating for artistic development in the community — and for the artists themselves. The Creative City Project has three objectives: One is to cultivate a thriving arts community in Orlando. The second is to help the residents of our city care more about it. And the third is to shape the global perception of our city as one known for innovation and creativity. From year one, we’ve had a relationship with Cirque du Soleil, and it’s been really wonderful. On a whim that first year, we gave them a call and said, “Here’s what we are doing. Do you want to participate?” We didn’t have a budget, and we didn’t really have much of a structure as an organization. But they agreed to participate. About 30 of their performers came downtown during a Friday lunch hour, and they performed a 35-minute original piece out in front of City Hall, and a couple thousand people came. It was really special. It’s easy for politicians to paint the arts and culture in a frivolous light. But there are a lot of organizations that work very hard at showing the economic impact of the arts and cultural experiences of a city. That’s really important for us to recognize. The arts aren’t frivolous. They’re an essential fiber of the city. Compared to much of the world, the U.S. doesn’t cultivate meaningful, city-wide cultural experiences — like Carnival in Brazil or the month-long celebrations of Chinese New Year. We believe that as people encounter meaningful, shared experiences as part of our annual event, IMMERSE, it transforms the way they perceive the people and spaces of our city. An example: The first year that we did the Creative City Project we had a photo booth in the historic city plaza. A van drove by and a family stuck their heads out and said, “Hey, what are you doing?” About five minutes later we see this family walking up the sidewalk toward our booth, and they took some photos and had a good time. This family lived in Argentina, and they were taking a van trip from Argentina to Canada and were on their way home via Florida. They were driving through the middle of downtown Orlando on a Tuesday night, and it was really dead. Had we not been there, that would have been their memory of downtown Orlando. But they came, and we connected with them. I’d like to think that when they think of Orlando, that that’s the experience they remember. As an undergraduate musical theater major at Brenau University, Elizabeth Horn ’10MFA was a performer and touring manager for a repertory company that visited K–12 schools in Georgia. The experience taught her about the importance of theater for young audiences, and she was hooked. Now, as an assistant professor in the graduate Theatre for Young Audiences program (a partnership between UCF and the Orlando Repertory Theatre), she’s working with her students and the local community to explore social and cultural issues through the arts. I have students who work with young people on the autism spectrum, with young people who are experiencing grief, and with young people who are in the foster care system. We are frequently looking at theater as a tool to access identity and emotional expression. That’s not what all theater for youth looks like — some of it is polished. If you look on Broadway, you’ve got musicals like The Lion King, Matilda and Mary Poppins, but this community-based work puts an emphasis on the individual and on process and growth over product. We worked on a touring production called Puddin’ and the Grumble. It’s about a young girl who, through changing circumstances in her life, finds herself with little food. A musical about childhood hunger is not what people typically expect, but it works beautifully. We’ve taken this production into a variety of schools — both schools where students may not be as aware of childhood hunger and schools where many of the students receive food backpacks every Friday to get them through the weekend. For the latter, it’s the opportunity to see their story reflected on stage and to have confidence in knowing that they’re not alone. It also helps them learn how to ask for help. We also helped pilot The Justice Project — a collaboration between UCF and the Orlando Repertory Theatre. In this project, we worked with young men of color at Evans High School, and we trained them in theater techniques. In our pilot program, we asked them, “How do you imagine a just community?” We asked these gentlemen to share their stories, and we crafted their stories and experiences into an original play. They’ll learn a lot of skills that will serve them for things like public speaking, but the primary thing that I’m hoping they’ll experience is empathy. The young men’s original script began with the line, “There’s more to me than meets the eye.” If you look at the police-civilian dynamic right now in our country, both parties are essentially saying this. All theater really has the power and potential to impact the community, but when we’re working with young people, we tend to focus on that more because we understand all of the opportunities for education and enrichment and personal growth. I think everyone, regardless of age, could benefit from experiences that lead us to all of those things. After spending 10 years in California and getting to know photographers who are exploring the medium as a fine art, Holly Kahn ’93 and her husband, Patrick, wanted to bring the contemporary world of photography to Orlando to enhance what they perceived as a burgeoning arts scene. The couple created Snap! Orlando to exhibit international and local photographers — and to educate the public on photography’s ability to branch well beyond headshots and editorial spreads. Prior to moving to Orlando, my husband and I spent about 10 years in L.A. — he was publishing a magazine and I worked in education. Within the first year, we felt a cultural void. We had a few museums, but very few galleries. There was no emphasis whatsoever on photography, especially as a fine art medium. Snap! Orlando was a leap of faith. One of the first people we contacted was Douglas Kirkland. He’s the one who photographed Marilyn Monroe in her bedsheets. He is a dear friend. We invited him to be our guest celebrity speaker, and he accepted. When we approached the Downtown Development Board of Orlando, they enthusiastically gave us logistic and financial support. Originally, we started as a popup show with no walls. Basically, we would have to find an empty warehouse. We would build an entire exhibition venue with lighting and moveable walls and within days it would be uninstalled and gone. We needed brick and mortar. After four years, we decided to find a permanent gallery space, where we could maintain a relationship with the artists and engage the community all year long. We connected with a woman who is an icon in the art world, Deborah Willis. She is the chair of Department of Photography and Imaging at the Tisch School of the Arts at NYU. She curated the critically acclaimed traveling museum exhibition, “Posing Beauty in African American Culture,” which explores the ways African American beauty has been represented in historical and contemporary contexts through photography, film and fashion. It had never been previously allowed to be exhibited in a gallery, but Deborah and the curatorial service trusted us. It was shipped from Los Angeles in huge crates, and it was unbelievable to open them and see these historical photos and iconic works. We did an exhibition called You Are Here. For 30 days we had a pop-up exhibit, programming, something going on every day. It was held throughout the city. What we were trying to do was show people the gems in the community, whether it was a clothing shop or a newly opened hotel. 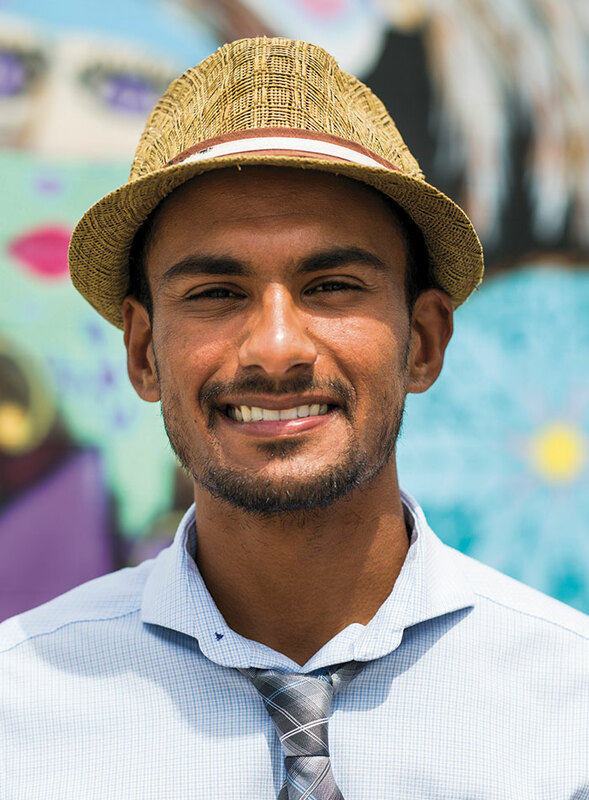 Harrison Rai, a former UCF business student, refurbishes old warehouses and rents them out. So when he saw the development going on in the Parramore District near the Orlando City soccer stadium, he purchased a few dilapidated buildings and brought them back to life. 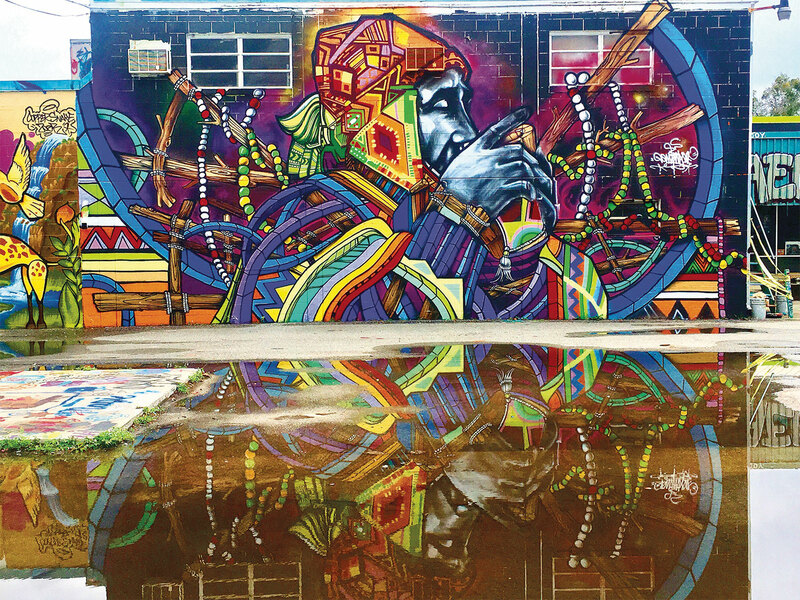 That space, now known as the West Art District, has become a go-to scenic spot as locals and tourists take in Orlando’s largest street arts exhibit. But Rai hopes it becomes more than just something to look at. Parramore is a great area; it just needed a little love. I started cleaning up the area — pruning trees, cutting the neighbors’ grass. Then I recruited artists to do murals on the buildings’ exteriors. As soon as the murals went up, the atmosphere changed. People were smiling a lot more. They were complimenting the art. We have six buildings, and one of them is going to be a startup incubator with 15 to 20 new businesses. In another building, we’ll have a coffee shop and juice bar. I’d like to put a bakery in there, too. We have another building for CrossFit and yoga; we have an outdoor lounge. The main building is going to be a hybrid event space, where we could have events with pop-up businesses, like restaurants or a microbrewery. We have a youth program here that helps take kids off the streets. It gives them free fitness training, and they also compete in tournaments. I would like to get five or six more youth programs established and have a giant program that involves mathematics, engineering, science, health, business skills — teach kids how they can be successful and live a good life. UCF saw what I was doing and knows I’m three blocks down from their new campus, so we connected and painted a mural together. So far, I haven’t had to reach out to any artists — they’re reaching out to me from all over the world, hoping to be a part of this. They’ve come from Canada, Venezuela, England, California, New York, Miami and Mexico. They all know what I’m trying to accomplish and give back to the community. We also have a practice wall for anybody that wants to come and paint. The best part about mural art is the reaction from people. Murals are beautiful, and they make the surrounding area beautiful. They make people happy. I’m hoping that 10 years from now this will be an activity hub for UCF, the soccer stadium and the K–8 school that’s going up a few blocks away. I see this as a big hub for students and locals. I hope kids come to the West Art District to learn arts, mathematics, soccer, science and engineering through after-school programs. The West Art District, to me, is about so much more than the art.